Electrostatic Dissipative floor. Seamless finish, Electri Resistant floor.Anti static Floor for Operation Theater, electrical industry. We provide professional service which includes consultation, free estimate, design, supply of materials and installation.We combine quality workmanship , international exposure and competitive pricing to provide our clients with unmatched service. EPDM rubber flooring is a seamless flooring for children’s play area. EPDM play top surfaces have more vibrant colors, more UV resistant colors, and a different surface texture. 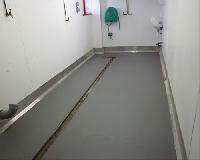 The non-slip surface is easy to clean and maintain and will be your safety surfacing solution for many years to come.